Description: Too often, individuals who have been called to practice their gifts and talents in the field of business and professional life sense that to serve God they ought to be doing something more directly involved with the church. Many successful business leaders, upon coming to faith in Christ or upon renewing their interest in God's Word, struggle with whether or not they should enter vocational ministry. Certainly, God calls some from among the professions into such vocations, but many simply haven't realized the full potential of where God has placed them. God's people who are assigned to duties in corporate boardrooms or offices, on sales forces, in entrepreneurial ventures, and as members of research and development teams are among his most effective servants. Believers who are active in the marketplace are surely among God's most treasured ministers and have the potential to have a wider impact and larger influence than most who serve in full-time vocational ministries. Likewise, these professionals have a capacity for great harm to the church and the cause of Christ if while they make claims of Christian belief, their actions prove inconsistent with what God's Word teaches--if their walk doesn't match their talk. Be encouraged! God wants to use you where you are. He wants to sanctify all of what you have learned and experienced. You have great potential in the kingdom! Endorsements: ""This book of devotionals is designed for the person who faces the demands and challenges of the day-to-day workplace....I would admonish the reader to make this a daily devotional guide. Dip often into the well of Biblical insights contained in this volume."" --from the Foreword by Bob R. Agee, co-editor of Faithful Learning and the Christian Scholarly Vocation ""Too often, Christians attempt to compartmentalize life and live in a dichotomous world. A Noble Calling presents a compilation of essays and devotions challenging the reader to develop a Biblical worldview for all facets of life, including ministry and professional careers. The authors clearly show that spirituality should not be divorced from professional life. A Noble Calling is an excellent source for professionals who desire to integrate faith with all aspects of life."" --C. Pat Taylor, President, Southwest Baptist University ""A Noble Calling is an excellent resource for anyone who has struggled with God's call to full-time Christian ministry within the world of business. The authors stress the God-given and God-developed character traits necessary for effective marketplace ministry. Each chapter is relevant and interesting....Every Christian serving in the business world should read this book."" --Robert H. Roller, President, International Assembly for Collegiate Business Education About the Contributor(s): David Whitlock is Associate Provost, Dean of the College of Business and Computer Science, and Professor of Business at Southwest Baptist University in Bolivar, Missouri. He has taught business and leadership for over twenty years. Whitlock is also an ordained bi-vocational minister. He now serves Wellspring Fellowship in Bolivar, Missouri. He and his wife, Dana, have four sons: Joshua, Ryan, David, and Landon. Gordon Dutile has served as Provost at Southwest Baptist University since 2000. He has also served as Professor of Greek and New Testament at Southwest Baptist University, as Dean at The Redford College of Theology and Church Vocations, and as Associate Pastor at Rosen Heights Baptist Church in Fort Worth, Texas." 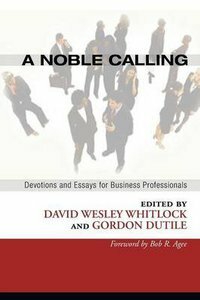 About "A Noble Calling: Devotions and Essays For Business Professionals"